Sunday Links: Philip Seymour Hoffman Plus The MBIP Coming Attractions! I watched the film “Boogie Nights" this week on Netflix and when I saw Philip Seymour Hoffman in the movie I realized I had forgotten he was in it. That happens a lot with him because the characters he portrayed in the span of his acting career were so varied and all over the place, it’s easy to forget that it was him playing the part. Here’s two examples of the scope of his talent, watch this and now watch this. It’s hard to believe it’s the same guy! He really played a wide variety of characters in his career and he had a real passion about acting. From everything I’ve read about him he was a real perfectionist and I think while he loved acting in movies and on the stage it also tore him up because it was such hard work for him. He died on February 2nd, 2014 from an accidental drug overdose. I believe when people are so passionate and consumed with art and perfection you need time to step away from your work now and again and sometimes drugs and booze are a convenient escape hatch to forget your obsession for a while. Philip Seymour Hoffman has been called the greatest actor of his generation, but I think he was one of the great actors of all time and below are six online articles about him. Then of course there’s the MBIP Coming Attractions as to what’s happening here next week! Philip Seymour Hoffman On Acting: An 'Exhausting' And 'Satisfying' Art - Some interesting highlights from two separate interviews on NPR. Every Philip Seymour Hoffman Movie, Ranked From Worst to Best - I’ve seen a lot of his movies, but this list reminds me I need to see more. Philip Seymour Hoffman’s Theater Career: Great Characters, at War With Themselves - Sadly I never got to see him act live on a stage but I need to search and see if any of those performances are online. Philip Seymour Hoffman: 12 scenes that make us miss him most - It’s actually eleven, because the Capote clip is deleted, but still a nice sampling of his acting work. 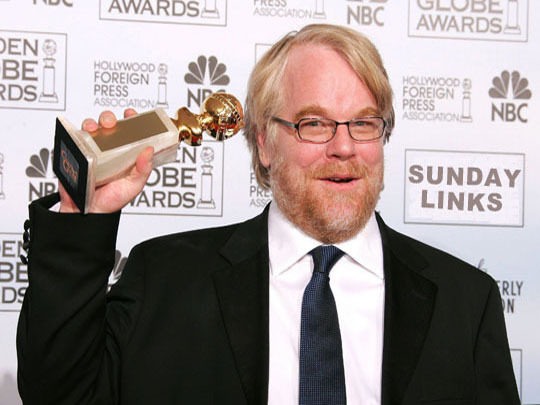 Philip Seymour Hoffman Wins Best Actor: 2006 Oscars - His acceptance speech for winning the Best Actor award at the 2006 Oscar Ceremony. I went to the new Los Cabos Cantina & Grill on Main Street in downtown Peoria last night and had an amazing dinner and some fun with some unexpected guests and the friendly staff that work there. Tuesday we’re going to literally wrap up the MBIP Seven Month’s Of Steak Tour, with links to some of the highlights and a homemade steak wrap made right here in the MBIP World Headquarters. Wednesday I’m having lunch at another new restaurant on Main Street, Something 2 Taco 'bout with my friend Tiffini and then we’re setting up my own personal Little Nut Hut that she surprised me with on Good Day Central Illinois. Thursday will be yet another random Peorian for the semi-weekly People of Peoria series and on Friday we’ll be sampling two different kinds of frozen chicken breasts. Saturday will feature another local storefront and then Sunday we’ll do it all over again. Till tomorrow, have a lovely little Sunday! Related Posts: Sunday LInks: Johnny Carson, Kent State Shootings and The Brady Bunch. I’ve been doing a weekly MBIP feature on the radio show The Church Of Rock which is broadcast live, worldwide out of Oregon on Sunday nights. Every week I pick a song and give a little talk about it before the song is played on the show. The hosts of the show are Rev. Derek Moody (some of you know him as Bloody Mess) and Sister Tracy. The show starts at 9PM CST and my segment will air around 9:15PM! The song I chose this week The song I chose for this week is YMCA by The Village People and I'll tell a story about meeting the Cowboy from The Village People in New York City. Be there or be L7! You can listen live by streaming from theKSKQ website right here! You should also check out the Church of Rock YouTube channel with archived interviews with everyone from GG Allin to Davy Jones!